Book Synopsis: Sometimes love is an accident. 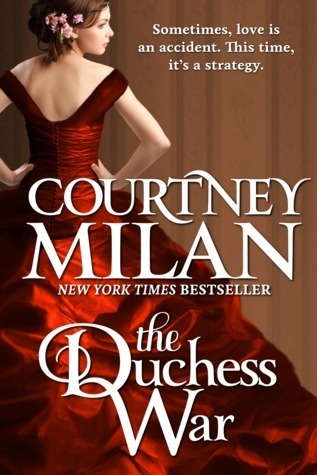 My review: The Duchess War is an indirect direct continuation of The Governess Affair. By indirect direct I mean it follows on from the ending of The Governess Affair but 20 years later, Robert Blaisdell, Duke of Clermont has grown older and continued hating his father for what he did to Oliver Marshall’s mother – Oliver Marshall is Robert’s half brother (older half-brother I might add) – and he’s on a mission to give back to the workers which is great and everything but not when he gets a half-innocent woman in trouble to do so. The Duchess War was very good, written in the same style as the Governess Affair and there was only the odd thing here or there I didn’t like. The plot line though I was a bit confused by – in terms of the hidden secret of Minnie – I think my brain is wired to think that she can do whatever she wants as it’s her life but then I remembered that in those days, a woman’s life wasn’t really her own at all and she was at mercy of her father/husband or chaperone. I get it I just don’t agree with it at times. Despite this confusion and dislike of certain factors in the book, I enjoyed it. I really liked Robert’s character – when I compare him to his father in The Governess Affair I can see that he’s the total opposite because he doesn’t want to be like his father and that’s a good thing. Minnie’s character, however, I wasn’t overly fond of as she was too meek and mild – outwardly meek and mild – then completely different with Robert which was a bit of a contradiction to me as every secondary and tertiary character was saying how quiet and mild Minnie was. It was a well compiled little story at just short of 270 pages, more of a short story to me but still well written, perhaps could have gone into a little bit more background detail on some of the secondary characters but other than that pretty good.